The USS Drum (SS-228) is located in Mobile, Alabama at Battleship Memorial Park. She's been there since 1969, and was placed on dry land sometime in the 1990's or early 2000's. And since she was launched on May 12, 1941, I believe that the USS Drum is the oldest of all the submarine museums listed on this website. A retired submariner named Tom Bowser and a park employee named Lesley Waters have taken up the task of restoring the Drum to her former beauty. Tom has vowed to spend 7 days a week in the Park working on the Drum (when he's not giving tours and such). The Drum does not get much income for restoration, as most of the money brought in via park entry fees and gift shop profits go towards keeping the park running and the USS Alabama, the main attraction (to some) at Battleship Memorial Park. The Park gets no federal or state money. with a notation on the check that the money is for the USS Drum Maintenance/Restoration Fund. More information about this fund, along with monthly updates on how the money is being spent and general happenings on the USS Drum can be found by visiting the Mobile Bay Base website and clicking on the link for the "Signal Ejector newsletter". Each month the newsletter is updated. The patch was created by the Lockwood Internet Base of the USSVI. 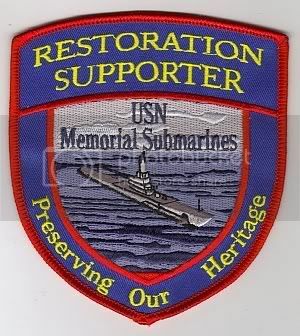 All proceeds from the sale of the "Preserve Our Heritage" patches go toward the submarine that the Lockwood Internet Base chooses to support that year. For 2008, the first year of this program, the Lockwood Internet Base has chosen the USS Drum. As far as I know, post-2008 proceeds from the sale of this patch will no longer go to the Drum, but to some other submarine museum in need as chosen by the Lockwood Internet Base of the USSVI. "Preserve Our Heritage" patches can be purchased from Ron Martini of SubmarineShop.com for $7.00 with free shipping. Item #P005. Ron Martini does not offer online ordering, so call 307-674-9847 with Visa/Mastercard in hand or mail your check to Ron Martini, 1723 DeSmet, Sheridan, WY 82801. Yep, you can see daylight through the stern of the Drum. Tom has found a donor of some steel, has succeeded in getting power hooked up for a welder, Sherwin-Williams is going to donate paint (and some labor I believe), and they are working on securing an air compressor to operate a large sandblaster. 2008 will be a big year for the Drum! Re: USS Drum and how to help her restoration! Thanks for the post Lance, I have been rather busy. Donations can also be sent to Lockwood or the USSVI charitable fund noted to either that it is for the Drum. I will post a progress report Saturday with current photo .